Hill Residence is a new development of 4 bedrooms and 3 bathrooms detached villas with private swimming pools located on a beautiful hill in Kargicak. 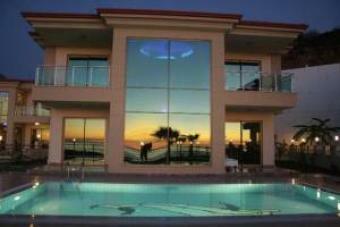 From out this location you will have unspoilt panoramic views of the Mediterranean Ocean and the Taurus Mountains. The villas are constructed to the very highest standard and are finished with excellent quality materials. Trough this elegant architecture design are these villas timeless, a world of luxury and natural surrounding. Distance to beach about 4 km. Each villa is built on a 500 M2 plot, with 230 M2 living area and a private pool of 32 M2. There are 4 bedrooms, where from 2 master bedrooms have an en-suite bathroom, modern kitchen with granite worktop. Each room has an air-conditioner. * 4 th payment of 25%. Delivery of the tapu, the construction of sprinkler system, landscaping.